It seems like just yesterday that I was reporting on Samsung putting an OLED display on a window pane. In fact, it was yesterday. This next product is very similar, as it is a Virtual Skylight. The company that made the SkyV HD Virtual Skylight is Sky Factory, and it allows the user to have a realistic skylight without putting a hole in their roof. These three HD LCD screens allow you to watch skies, birds flying over, trees swaying in the breeze, or just about anything else you want to program in it. If it were me, I wouldn’t mind seeing spaceships fly over. I would count them instead of sheep. Of course, if you wanted a little realism, you could probably just mount a waterproof camera on your roof and get a realtime shot of the sky. Hopefully it would look like a real skylight. 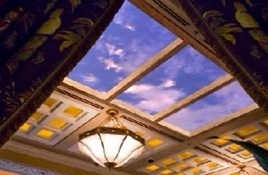 So real, you might have to tell others your skylight is a fake. I’m not certain how much this particular item will cost, but I’m guessing it isn’t cheap. I’m also not certain how you program the SkyV, either. Hopefully it has some wireless feed that you can program from your computer. You can find out as the SkyV will be seen at trade shows and expos later this year, and should roll out sometime next year.